While I was sick I did a lot of reading. The Christian based book I read consisted of historical prairie Christmas stories. It was refreshing to read how women lived in the 1800s. Women didn't cook for fun but for necessity. Everything was made from scratch. For quick filling meals, women prepared biscuits and gravy or soup with homemade bread. I felt inspired by the women in this book. How quickly I run to the store and buy the ingredients that I need. Women in this era traveled by dusty long wagon rides into town to purchase their ingredients. In The Southern Heritage Cakes Cookbook, it explains how women's baking flourished after the introduction of baking powder and the rotary beater. Cakes were given names from either famous people or places like General Robert E. Lee cake, Williamsburg Orange cake, etc. I felt like I had experienced a little of what it was like to be in an era like this when Hurricane Katrina hit. My dad made a brick lined pit and topped it with a broken wrought iron table to make a grill. My mom used all her cast iron pots and pans and even a blue speckled tin pot to do all of her cooking. I helped her prepare biscuits, peach cobbler, and bread pudding cooked in a cast iron pan tented with aluminum foil to act as an oven. Besides participating in cleaning up fallen tree limbs and debris, I helped my mom prepare each meal. This was an endeavour when a fire had to be built and we didn't have running water or electricity. How easily we take for granted the things that we use every day. I decided I was going to make an old fashioned dessert. I can't say that the idea at first sounded that appealing to me but I was going to make it taste good. My mom told me how her mom used leftover rice to make rice pudding. It is a very economical dessert in this respect. After some research, I discovered that this dessert is consumed worldwide. In the Phillippines there is Champorado (chocolate rice pudding). Kheer is a slow boiled milk rice pudding from India. Add milk, eggs, raisins, and orange peel to rice to make Budino di Riso, Italian rice pudding. For my rice pudding, I prepared Vanilla Bean Rice Pudding. I used cooked Jasmine rice and a whole vanilla bean. I loved the fragrant aroma and robust flavor the vanilla bean added to the rice pudding. From my recent trip to New York, I was inspired to prepare toppings to go on my rice pudding from a place we visited called Rice to Riches. It was like walking into a yogurt shop. There were multiple rice pudding flavors such as cheesecake and chocolate chip. Then there were topping choices such as roasted strawberries and toasted coconut. I prepared an almond brittle to top my vanilla rice pudding. It added a great contrast of textures. I don't consider rice pudding old-fashioned any more; it has been revitalized. Prepare my rice pudding recipe this New Year's for your friends and family and enjoy a taste of the past as you celebrate the new year. Heat the rice, milk, whipping cream, sugar, and salt in a medium saucepan over medium-low heat, stirring until sugar has dissolved. Add vanilla bean seeds and bean into rice mixture. Reduce heat to low and cook for 15 minutes on low, stirring occasionally. Remove from heat. Discard the vanilla bean. Beat egg and egg yolk in a small bowl. To temper the eggs, stir in a few tablespoons of the hot milk mixture into the eggs. Slowly mix in egg mixture into saucepan. Return saucepan to low heat and cook for 5 minutes, stirring constantly. Remove from heat and stir in butter. Let cool for 5 minutes. Serve rice pudding warm or pour into a bowl and refrigerate for 1-2 hours and then serve. Christmas morning I slept in. This would not have been a thought in my mind when I was younger. The earlier the better ha ha. My two sister and I would spring out of bed at 6:00 a.m. or earlier. My first thought when I woke up was that I need to slip into my living room and stuff the goodies my sister and I bought into my parents stockings. My dad received chocolate covered raisins, a moon pie, and other goodies. My mom's stocking was filled with Almond Joys, Reese's cups, and more. In between their stockings, I put a six pack of glass bottled Old Town RootBeer Company root beer for them to share. Old Town RootBeer Company is located in San Diego, CA's Old Town. My family and I came across this store when vacationed in San Diego a few summers ago. This was the best root beer I have tasted. It is very smooth. You don't have the carbonation that hits you first like most root beers but the delicious flavor. We thought that we would not have the opportunity to taste it again until our next visit to San Diego but I was very surprised when I walked into World Market and in the drink section was Old Town RootBeer Comany's root beer. Before opening our presents, my dad and I prepared breakfast. I made waffles because they are my dad's favorite. He made his famous scrambled eggs. It is his speciality in the kitchen. They are like fluffy pillows. We finally opened our presents, got dressed, and went to my great grandmother's house for Christmas lunch. My Christmas feast was going to be prepared for dinner. There ended up being a change of plans. My grandpa wasn't feeling well and so did not join us for lunch at my great grandmother's house. We went to his house to check on him after lunch. He was very ill. From his symptoms, we thought he might have had a mild stroke. We helped my step grandmother load him into her vehicle and we followed her to the hospital. The emergency waiting area was where I would spend the rest of the Christmas night. You might think that this would have been a terrible place to spend Christmas but it wasn't that bad. Some of my relatives came to the hospital to check on my grandpa so I was able to spend time with them. I realized from watching people constantly coming into the emergency room that one of the greatest gifts I received is my health. My great grandpa is still in the hospital and the diagnosis right now is that he has a bad strain of the flu. He was running a very high fever of over 103. He is still having test done one of the things is to check for brain damage that could have occurred from the high fever he experienced. Please keep him in your prayers. Sunday: Today is the Lord's day let us rejoice and be glad in it. I did not get to prepare Christmas dinner for my family yesterday. I have a sore throat this morning which I think I acquired in the hospital waiting area. My parents went back up to the hospital to check on my grandpa so it doesn't look like I will be preparing the meal today either. The closest thing to cooking turkey today will be the other white meat- chicken. I prepared homemade chicken noodle soup. It will not only be good for me but to bring to my grandpa. My mom always made me chicken noodle soup when I was sick and it made me feel good. I hope everyone had a wonderful Christmas. The Lord has blessed my family this year and I hope everyone takes the time to thank the Lord for the greatest gift he has given us which is his Son- Jesus. It has been a tradition in my family to go to my great grandmother's house on Christmas Eve night to celebrate with my mom's side of the family. It is a fun time of eating, laughing, and "fighting" over gifts during dirty Santa (a game in which everyone brings a gift, draws a number out of a hat, and then takes turns opening or stealing someone's gift). This year I ended up with a Wal-Mart gift card, which I can put to good use. Before our fun and crazy game of dirty Santa, my great uncle or this year my grandpa reads Luke 2 from the Bible of baby Jesus's birth. My mom told me that my great grandpa used to read this passage and after his passing the honor was passed down to his elder son. My family is very close and one thing that keeps us close is that we center our family around Jesus. I am very blessed to have the family that I do. Christmas day will be arriving in a matter of hours. What do you ask for, for Christmas? I love to cook as if you didn't already know ha ha. 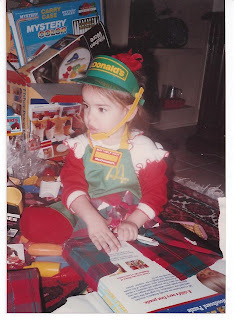 Since I can remember my Christmas' list have included cooking utensils, kitchen equipment, etc. I am definitely the only one out of my friends that have asked for a blender, stand mixer, and blow torch for Christmas. My culinary skills have increased each year from the gifts I received on Christmas. Let me recall a few items I have received. My gifts have included stainless steel mixing bowls, stand mixer, blender, blow torch, pastry bag with tips, and cute measuring cups that I saw Paula Deen use on her show. The measuring cups are now found almost anywhere but when I wanted them it was very difficult or at least that is what my mom told me who searched every where for them. She did find them and I enjoy using them today. A lot of my Christmas presents have been put to use on Christmas day. My stand mixer was used to make a boiled icing for my coconut cake with lemon cream filling. The blow torch was used to make creme brulee. My family enjoys my gifts as much as I do from the scrumptious benefits. From my recent visit to a restaurant that I would vote has the best mashed potatoes, I have been inspired to make the best mashed potatoes for my family this Christmas. I researched how to make the best mashed potatoes. There are many theories out there which include using a potato ricer, masher, food mill, and stand mixer. My research has concluded that the food mill will produce the smoothest mashed potatoes. So what do you think I asked for, for Chrismas? a food mill. I will let you know if I receive it and if I do, will a food mill aid in making the best mashed potatoes? Good night everyone and don't forget to leave "Santa" his milk and cookies. I know my "Santa" ate his delicious cookies up every year. I love traveling and a good thing because I have been doing a lot of it lately. I just drove over 7 hours today to Greenville, SC. Our halfway point to our end destination of Williamsburg, VA for a family vacation. I am sad that I only have one night here. On first impression, Greenville has great shopping. I love the fact that there is a Whole Foods and Trader Joe's. My parents and I ventured downtown after we checked into our hotel. I immediately fell in love with Greenville after driving through their downtown. It felt especially inviting with their Christmas decorations up. Lights hung from trees, Christmas trees, wreaths, Santa and his sleigh, and a beautiful white horse drawn carriage were all the sights to see downtown. Now for the important part where did we eat. My mom researched (Googled) a restaurant for us to eat at and we were also given a recommendation at our hotel for Soby's. The atmosphere of the restaurant was inviting and relaxing. We passed a lit gas fireplace as we walked to our table. I felt warm from just the view of it from our table. The restaurant describes its style as New South Cuisine. I was intrigued by many dishes featured on the menu. We decided on their Fried Green Tomato Napoleon served with blackened haricot verts and pimento & cheese fondue for appetizer. This was the best fried green tomato I have ever had. The pimento and cheese fondue sauce was very good. After the appetizer, we were served warm biscuits.There is nothing better than a warm biscuit. It was a tough decision on choosing the entrees. My mom and I shared Soby's Meatloaf With Maple Creole Mustard Glaze- fresh ground beef tenderloin, exotic mushrooms, mashed potatoes, heirloom pumpkin succotash. It was brought to us already split on two separate plates. The portion size was more than enough. The meatloaf tasted as if I was eating a steak. It was flavorful and moist. Now to the Best Thing I Ever Ate- Mashed Potatoes. These were the best mashed potatoes I have ever eaten. They were rediculously good. The smooth texture was unreal. My dad ordered Applewood Smoked Bacon Wrapped Pork Tenderlion served with mashed potatoes, broccolini,and habanero butter sauce. I am not a huge fan of pork except bacon but this dish made me a Pork Cheerleader! ha ha. The pork tenderloin was so tender you could almost cut it with your fork. It tasted almost like you were eating a steak. It was also served with their rediculously good mashed potatoes. My mom and I helped my dad clean his plate. If you are in, around, or in driving distance of Greenville, SC, I encourage you to drive through their downtown and dine at Soby's. Take the time to enjoy spending time with your family this Christmas season. Happy Travels! I have just returned from New York City. As a newbie to New York, I did a lot of research of where to go, what to do, where to eat, etc. I think I did well at hitting all of the top spots. After a long flight, my mom, sisters, and I were starving. 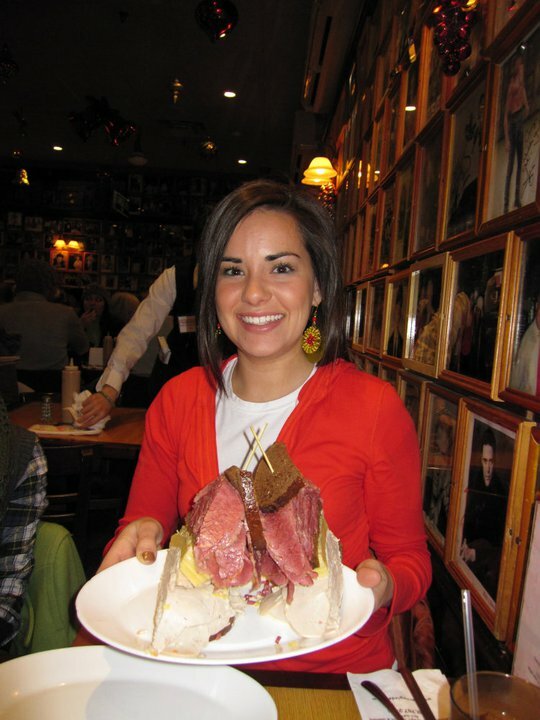 Our first taste of New York was at Carnegie Deli. I don't think any of us were prepared for just how big the triple decker sandwiches were going to be. No worries though we did end up sharing this huge sandwich. After a good night's sleep we were refreshed and ready for what all the city had to offer. We ventured to Central Park, where we shopped at booths for jewelry, scarves, art, etc. For lunch we were recommended to eat at Whole Foods. This was great, not only did we have an eclectic menu but it was fairly affordable for New York. For dinner, we made reservations to Serendipity 3 to try their "famous" frozen hot chocolate. I was in anticipation for lunch on Tuesday because I was going to Eataly. I had heard amazing things about it and Joe Bastianich (Masterchef judge) was giving us a tour and joining us for lunch. Eataly features a market of amazing fresh produce, the largest array of dry pastas in the U.S., several dining options, gelato counter, etc. For lunch, we had pizza and pasta. My mom raved over her pumpkin lasagna. While enjoying our meal, my mom and sisters got star struck over someone to the left of me. 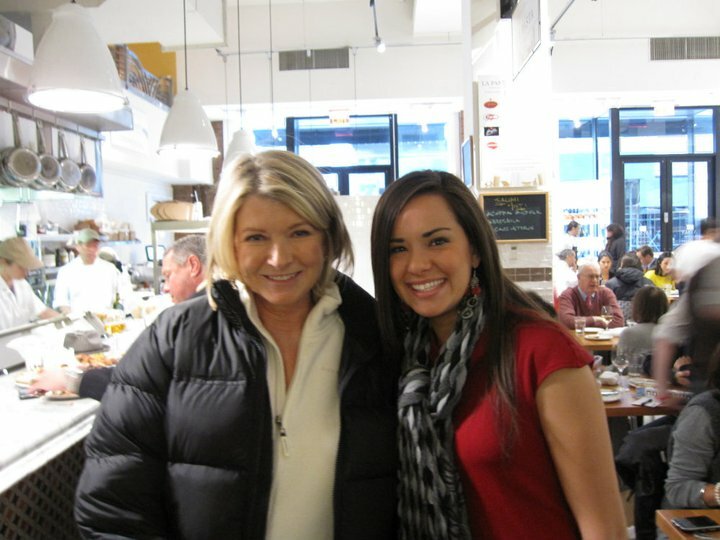 I had no idea what the big fuss was over until I looked to my left to find the Martha Stewart! Wow, was I really that close to Martha. Joe introduced me to Martha as the winner of Masterchef and the Pastry Princess. Our evening included shopping in Chinatown. We stopped for a snack at Sung Sai Gai restaurant for a steamed pork bun which was pretty good. I would recommend the steamed bun over the baked. Then we traveled across the street to Dragon Land Bakery for their coconut cream buns. After a fun filled, interesting day of shopping in Chinatown, we dined at Babbo. When I go to a restaurant for the first time, I always ask menu recommendations from the waiter. I took his recommendation for their lamb chops. I was being adventurous because I had never eaten lamb. This was the best lamb I had never had ha ha. When it came to desserts we tried a little of everything. A complimentary dessert from the pastry chef was a saffron panna cotta with quince sorbetto. Wow this dessert was amazing! 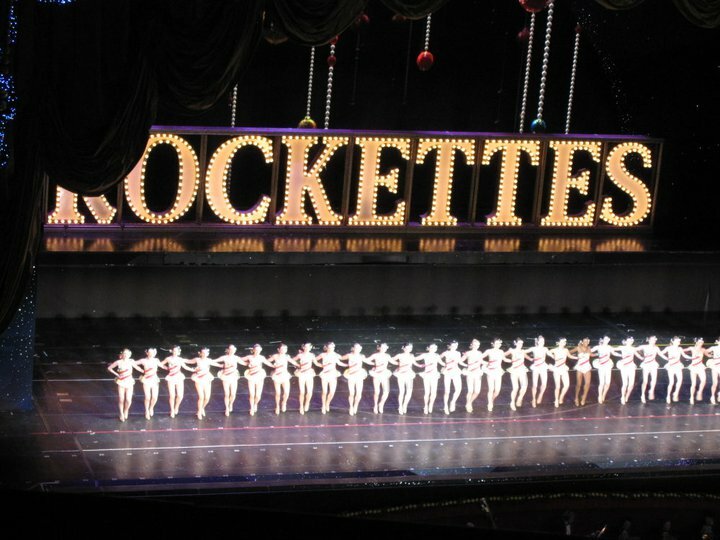 On my list of places to go was Radio City. We wanted to see the Rockettes. This was such a fun show. I was very appreciative that not only did they celebrate Santa Claus but also baby Jesus's birth with the Nativity Scene. Jesus is the Reason for the Season! A six day trip is hard to write about in detail in one post. I will write my breakdown of the rest of my trip. Thursday- lunch @ Joe Bastianich's Becco- the best Italian cuisine dinner in Little Italy & dessert- Rice to Riches *try chocolate chip rice pudding & cheesecake rice pudding....yummy!